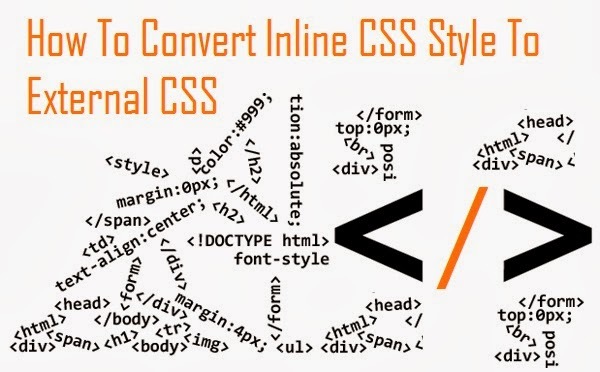 CSS (Cascading Style Sheet) is declared to maintain the formatting, layout and appearance of Web page elements. You can include CSS declarations in multiple locations in an HTML file, including inline, internally and optionally in an external file. 1. Open a new file in a text editor and save it with a ".css" extension -- for example, "blogpage.css" or any other name you prefer. Add a link to your style sheet within the head section of your HTML page. Open the page and look for the closing "</head>" . Alter the "href" attribute value if you saved your file with a different name. <div style="color:#FH0000; background-color:#333000;">Text in element</div>. 4. Now select the text listed between the quotation marks as the "style" attribute, copy it and paste it into your CSS file. Delete the entire style attribute from the HTML element when you have it copied into your style sheet. 8. Copy the code between the "style" tags and paste it into your CSS file. Delete the entire "style" area from your HTML when it has been successfully copied. Save your file and you are don with moving inline CSS to external CSS.